Daily Illuminator: Ogre Predicts The Future! January 24, 2013: Ogre Predicts The Future! 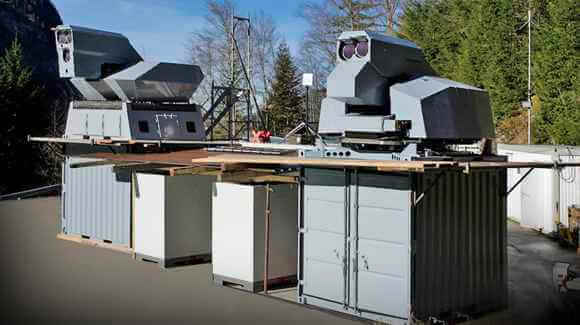 These real-life military lasers recently tested in Germany look eeriely like Laser Turrets from the original Ogre supplement, Shockwave. Almost thirty years ago, Shockwave predicted that lasers would have a role on the battlefield, primarily in shooting down Cruise Missiles, but also as direct-fire weapons. The German lasers have now successfully intercepted a 82mm steel ball travelling at 50 metres per second (the exact size and speed of a mortar round), and cut through a 0.6 foot steel girder from a kilometer away. Not to be outdone, the U.S. Navy reports that it's just two years away from fielding its own direct energy weapons. The Congressional Research Service paper on Navy lasers is publically viewable, including the fascinating information that -- once built and installed -- laser countermeasures might cost mere pennies per shot, compared with $800,000 to $1.4 million each for current short-range air defense interceptor missiles. That's a lot of tax dollars saved!